A rainy cold front swept through and left a yen for fall comfort food. In the moment, I made flavorful lasagna with ricotta and chard leaf filling, creamy topping and crispy whole wheat noodles, garnished with the color and crunch of red chard stems. Light yet earthy. Fit for a season that hovers between summer and fall. 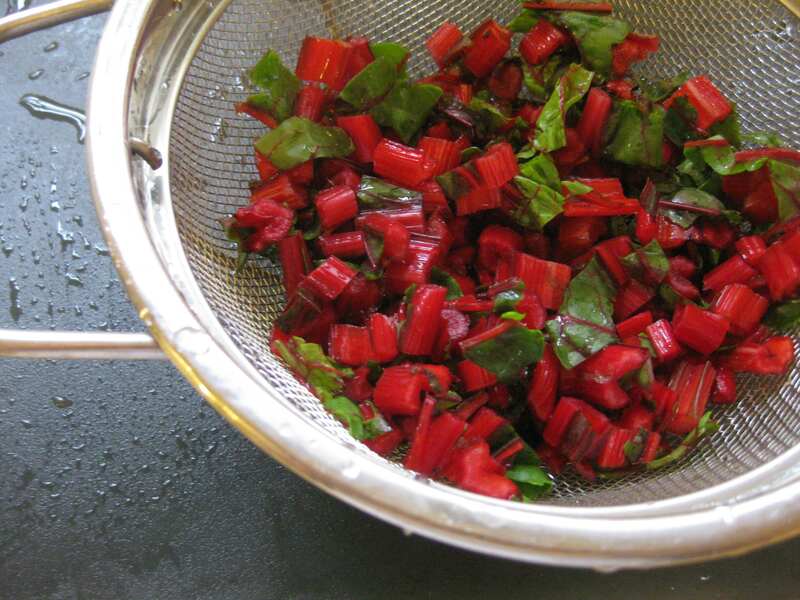 While I gravitate toward green chard, or the gorgeous golden-stemmed variety I grow at home, a giant bunch of red chard with brilliantly colored stems ended up in my CSA produce basket this week. It was simply too large for the refrigerator, so I washed out the plentiful sand, separated the stems from the leaves and cooked them all down into a pint-sized container. Amazing. I like to cook greens in just a little water, a process I refer to as shallow boiling. After the greens reduced, I used the residual water to cook the stems, ending up with almost no water to discard, which kept the flavor fully intact in the vegetables. After the collard “noodles” I made last week, I had been thinking about making lasagna with collard greens instead of or maybe along with pasta. So the idea of lasagna was already pinging around in my head when I deliberated what to do with the chard. 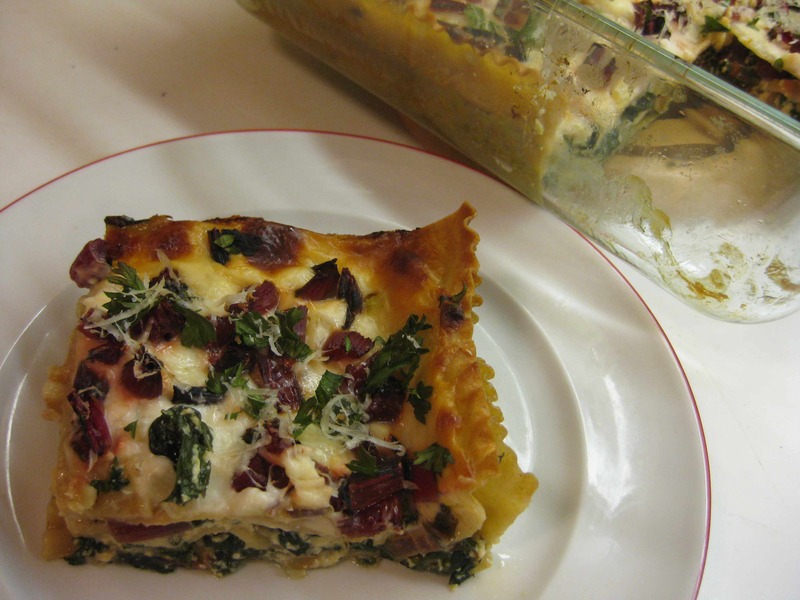 I loved the green chard and walnut lasagna I made in the summer and I thought that the red chard stems would create a similar textural contrast to the leaves and cheese. For that, I used fresh pasta sheets. This time, what I had in the pantry were dried whole wheat lasagna noodles. Whole wheat pasta often resembles pasty cardboard, which detracts from the rest of the dish. Not this brand. It’s organic, made in Italy and contains 100% whole wheat. It sells under the brand “bionaturae,” and is a very interesting European import (shooting my principle of local sources but worth the experiment). The dried noodles are thin and flat, which bodes well for light lasagna. They were great. And I cared for them while cooking to encourage their texture and flavor (see recipe). 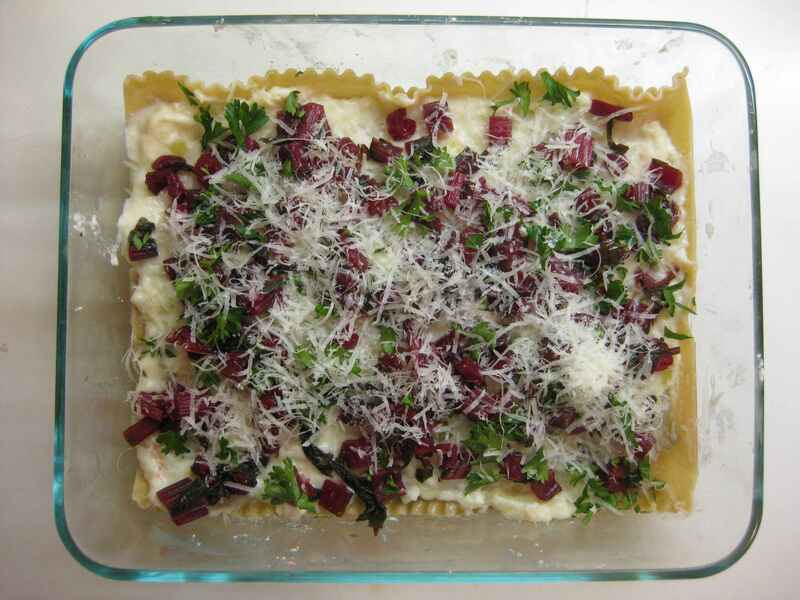 For the filling, I opted for the simplest combination of ricotta cheese, Parmesan cheese and chopped chard leaves, made aromatic with freshly grated nutmeg. One trick is to hold the filling slightly back from the edges of the noodles. This not only contains the filling during cooking but also allows the edges of the noodles to crisp slightly. Chard stems added crunch to each layer. The topping, a simple white sauce seasoned with onions, as creamy but not unctuous. Sprinkled with chard stems and Parmesan cheese and garnished with fresh parsley, the result was as visually pleasing as it was delicious. For a dish that just evolved, I was happy. Wash the chard well. Separate the leaves from the stems and chop or tear them into medium-sized pieces. Chop the chard stems into ¼-inch pieces. Bring a small amount of salted water (1/2 – 1 inch) to boil in wide pan and add the chard leaves. Cook until they are tender, about 5 minutes. Remove the leaves to a colander to drain and cool. Add the chopped chard stems to the water remaining in the pan and cook them until tender, about 5 minutes. Remove to a colander to drain and cool. The bunch of chard that I used yielded approximately 1 c cooked and chopped leaves and ¾ c chopped stems. Prepare the noodles. Bring a large pot of water to a boil and salt it liberally. Cook the noodles until al dente, about 6-8 minutes. Remove and drain under a little cool water. Spread them on towels to drain and sprinkle them with a little olive oil and salt while they’re cooling. Prepare the ricotta-chard filling. Squeeze the cooled chard leaves to remove as much moisture as possible and chop them fine. 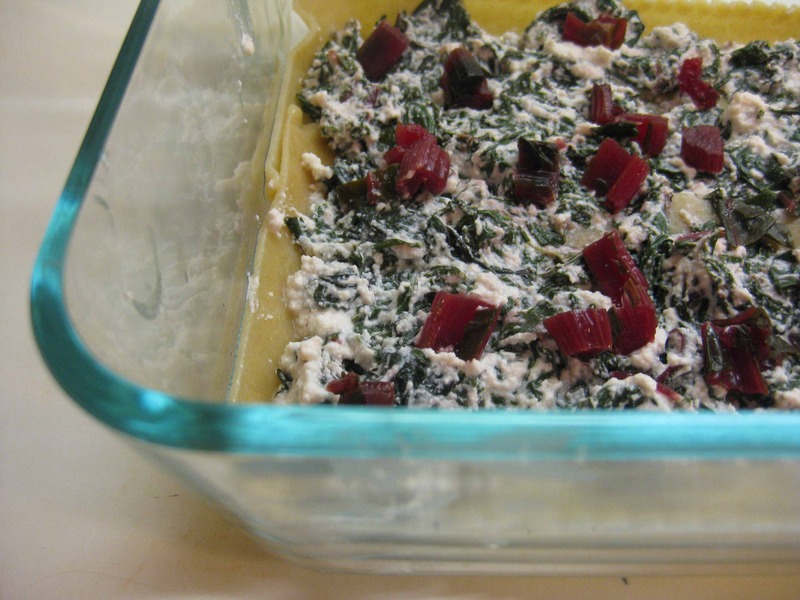 Combine the chard leaves with ricotta cheese, ½ c of the Parmesan cheese and the grated nutmeg. When ready to bake the lasagna, let it come to nearly room temperature if it has been refrigerated. Heat the oven to 350 degrees. Bake for about 40 minutes or until the bottom is bubbly and the top is browned. Let the lasagna sit for ten minutes before serving. Serves 4-6 depending on the portion size.